From uploading photos to organizing receipts, here are five free wedding apps that even the most tech-challenged person can use with no trouble. This story has been updated from 8 a.m. ET to include more information on The Knot's mobile app. NEW YORK (TheStreet) - Wedding season is officially upon us, and that means no shortage of Facebook (FB - Get Report) status countdowns, Instagram-shared photos of airbrushed brides, and their Pinterest-inspired weddings. But planning a wedding is nothing short of a part-time job that takes a huge amount of effort to organize. I can attest from personal experience as I plan my own November wedding, the planning is not easy -- even for the most dedicated individual. From researching which color the bridesmaids dresses should be (eggplant or a plum? ), to how much should we tip our vendors (do I tip the bathroom attendant? ), to coordinating pick up and drop off times for the limo, while sticking to the budget. Thankfully, in this day and age, the availability of mobile apps are the perfect way to collect, file and digitize the everyday planning and even experiencing of a wedding. "Couples are more focused than ever on creating a unique, personalized and once-in-a-lifetime experience for their guests - plus they're doing so in a modern way, by planning from their smartphones, publicizing details on social media and more," said Carley Roney, co-founder of wedding Web site, The Knot, a subsidiary of XO Group (XOXO, in a March survey on wedding trends. Most brides are aware that The Knot is the place to be when it comes to wedding planning from inspiration, to shopping for bridal party gifts, budgeting and vendor research. The Knot Wedding Planner aims to be a bride's complete mobile answer to wedding planning with solutions for organization, inspiration and hiring vendors. The Knot re-launched the app in January and boasts that since then "brides and grooms have spent more than 3 million minutes inside the app, viewing more than 36 million wedding vendor recommendations." Scrolling through the Apple (AAPL - Get Report) app store, it's easy to see how many apps are related to weddings, some more useful than others. Besides The Knot there are tons of other cool apps where wedding planning meets technology that have sprout up that also deserve attention. From uploading photos to organizing receipts, here are five free apps that even the most tech-challenged person can use with no trouble. Create your free account, invite your guests via text, email or Facebook and start capturing the moments. Yes WedPics is that easy. And yes, it's totally for both brides and grooms to enjoy. 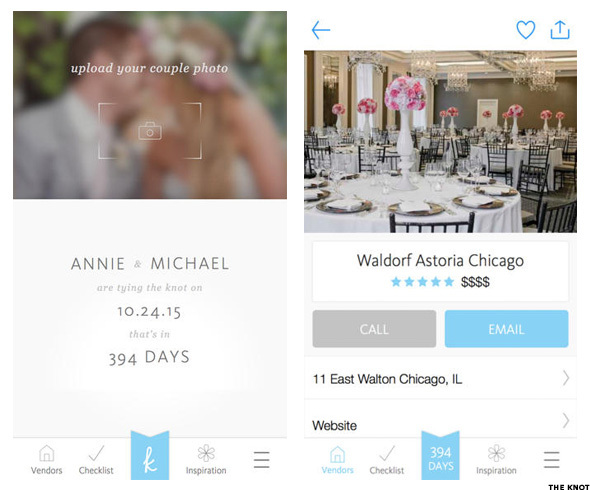 Last month, the app hit the 1 million user mark, which includes brides, grooms and wedding guests using the app. WedPics has an app for both iOS, Google (GOOG - Get Report) Android, and a web platform that allows wedding guests to upload unlimited photo and videos to a bride's private album, the company says. Photos can be taken in the app, uploaded from a phone gallery, or uploaded on the web from a digital camera. They can also be printed using WedPics print services, which are mailed to a user's home. 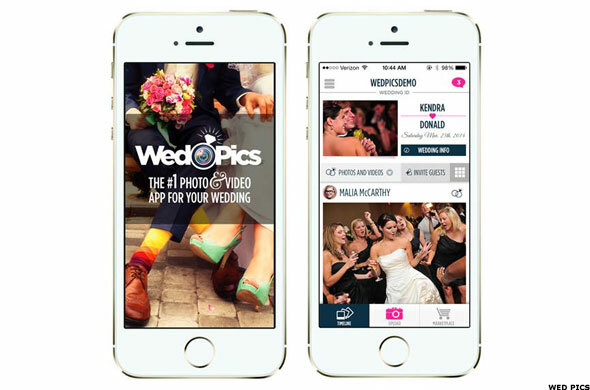 Sort of like the Instagram for weddings, WedPics is like a mini social network for an individual's wedding. They can then be shared via Twitter (TWTR - Get Report) and Facebook, or if a couple wishes to keep them private, they can turn off the sharing feature. In addition, photos uploaded in the app can be edited with fun photo filters. WedPics also offers the ability to create photo albums such as engagement photos, bridal shower, bachelorette party, rehearsal dinners and honeymoons, for instance. Full disclosure: My own wedding photographer notified me this week that they partnered with WedPics as their mobile app of choice and automatically created an account for me. So I will get to see just what this app can do in a few months. This app sounds awesome, especially for the control freak in me who wants to see ALL photos from the big day! I can't wait to use it. Brides, you'll appreciate this one. Think of what happens when you go on Pinterest and click on the Weddings category. Don't you get that warm, fuzzy feeling when wedding-related Pins pull up? That's the gist of Lover.ly -- an app and web wedding inspiration board where users can search decor to dresses to jewelry and flowers and even click through to buy said inspiration. Lover.ly was launched on Valentine's Day in 2012, by a "one-time maid of honor and her team of former bridesmaids and groomsmen determined to simplify the wedding planning process," says the site. "A huge part of our audience is the twenties and younger thirties [demographic]," says Lover.ly Chief Brand Officer Meredith Howard. "They are hungry for a tech solution in the wedding space." Howard says that before Lover.ly aggregated bridal inspiration, women would be searching 30-pages deep via Google across tons of Web sites. It was not efficient to say the least. 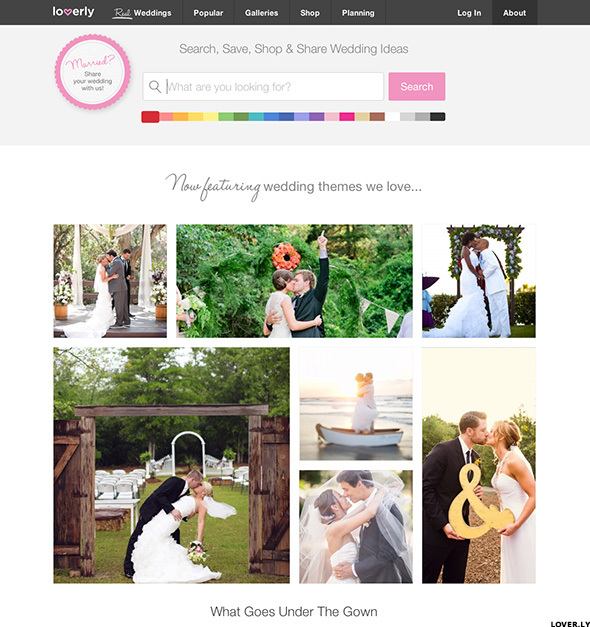 "Our plan is to make wedding planning easier and more fun and were constantly iterating on that," she said. The app, launched in April 2013, has gotten more than 120,000 downloads. Currently it is only available for iPhones, but an Android app is coming in the near future, Howard noted. The Web site has roughly 2.6 million users. Lover.ly's Howard also talks of how each picture is tagged with up to 50 Search Engine Optimization keywords and tags such as where to buy the dress or the location of a reception to "give the user a ton of information to plan," she says. Lover.ly works with large retail brands such as Nordstrom (JWN - Get Report), Donna Morgan and Macy's (M - Get Report). "We're like Pinterest meets Google Search. Add in some emotionally intelligent tagging and it all of a sudden becomes a super-modern way to plan," she added. Photos can be saved in so-called bundles, basically a digital folder, and shared publicly or with just a few users. "It's just an easy solution to kind of connect all of the dots that have thus been not connected," Howard stated. "We really want this to be a solution. We're really taking this macro look at how we can fix all of the pain points" to planning a wedding. Think of all those vendor contracts and receipts that must be collected, read and filed when planning a wedding. Wouldn't it be easier if all that physical paper was in one place, easily pulled up on an iPhone and shared with your fiance, parents or wedding planner? 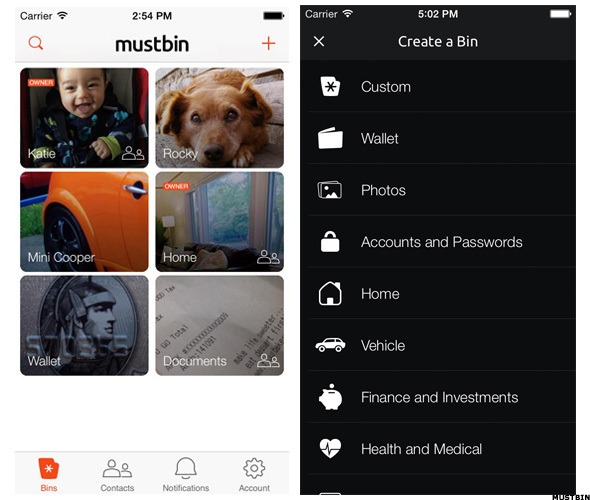 Mustbin is a secure storage, organization and sharing app that lets users capture information using their phone's camera, store it in pre-built and custom "bins," and privately share with trusted contacts. Mustbin keeps wedding agreements organized, secure and private (especially credit card details). By snapping images physical documents, users can create a Wedding Bin for safe, digital keeping of multiple page documents that users can also share and export to PDF files if a physical copy is needed again later. Brides and grooms can also collaborate in real time on planning details by using Mustbin's private messaging. The company boasts security features including "bin-level encryption, AES-256 encryption on every file and end-to-end encryption during cloud sync." "With Mustbin's security, no company employee can ever view a user's data, and aims to make it as hard as possible for anyone else to view that data," the company said in an email. Mustbin was launched in November 2013 and released its iOS 1.4.0 version. The Android version is expected out later in the year. For brides that veer slightly to the control-freak side, AllSeated may be just the tool for you. 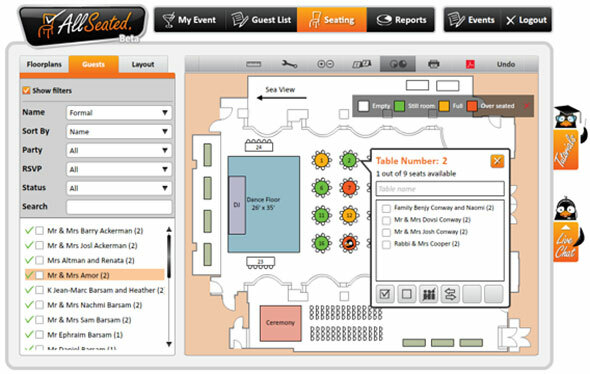 AllSeated, created in late 2012, is a cloud-based network that connects venues, event planners, vendors and event hosts to scaled floor plans of a reception location. Hosts can then create seating charts using imported guest lists. AllSeated co-founder Sandy Hammer says that in just a year, thousands of venues across the U.S. are using the tool, and the company is always searching for more venues to add. (I actually suggested that Hammer contact my own reception site so that I could use the tool as well.) Next month AllSeated plans to launch its mobile app that will be available on both Apple and Android-based tablets. "We work with any type of map -- from blueprints to napkin drawings that someone will send us," Hammer says. "Our real specialty for what we're doing today is obviously collaboration," noting that the event industry is far behind in creating tech-facilitated collaboration tools. "Instead of hundreds of emails and PDF [files], never mind changes on the guest list ... For the first time everybody is working on one master floor plan." Remembering how daunting it was to create our gift registry at a Bed Bath & Beyond (BBBY - Get Report) store and how completely bleary-eyed my fiance and I were when we walked out that we went straight to the nearest bar, the idea of registering online at MyRegistry sounds fabulous. MyRegistry takes the hassle out of gift registering at multiple stores by creating a universal gift registry. MyRegistry has partnered with thousands of stores and lists more than 126 million items on its site from big retail chains to your local small business, online and offline, to provide registry services from Amazon (AMZN - Get Report) to Macy's to Urban Outfitters' (URBN - Get Report) Anthropologie and not just for weddings. Users can register for any gift-giving occasion, including weddings, baby showers, birthdays, graduations, housewarmings, holidays, etc. Members scan items to find the best prices on the things they want and can add gifts from any store in the world, even those without a website, using the offline gift feature, it says. MyRegistry offers useful tools that make the registering and managing process easy, including free customizable e-cards, text message alerts and thank you note reminders. The app is available on Google Play and iTunes app store. Guests can also "tastefully" register for cash with MyRegistry.com's Cash Gift Fund, which lets a gift giver put money towards the bride and groom's honeymoon or even date night activities. "We see a huge increase in our members managing their registries from their phones" MyRegistry President Nancy Lee said in a January release announcing MyRegistry's iPhone app 2.0. "Giving them great mobile tools is a key priority for us this year." 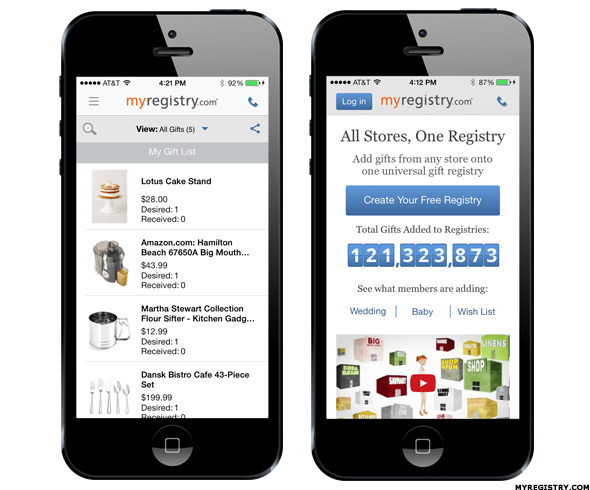 The 2.0 version incorporates every major feature available on the online version of MyRegistry.com into the mobile version with an easy to use new user interface, it says. The upgraded mobile app is also optimized to work with retailers using the MyRegistry.com Kiosk for Merchants, enabling quick and easy registry creation from inside of those brick and mortar partner stores and dedicated scanning capability of the inventory in those stores. Whole Foods Plunges: What's Wall Street Saying?